The Bolivarian Revolution in Venezuela is facing its most challenging times. The right-wing opposition, backed by the United States, is engaged in a full-blown “regime change” campaign, with violent protests occurring daily for over 2 months and resulting in over 50 casualties. 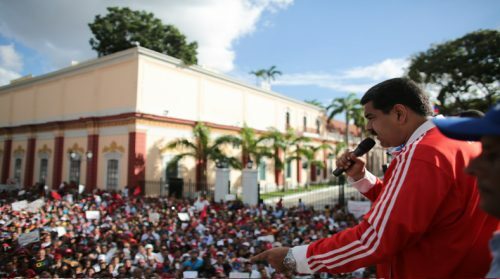 The chavista supporters of the government have also taken to the streets in defence of the Bolivarian Revolution, and President Maduro surprised everyone by calling for a Constituent Assembly. To better understand the situation and where it might lead to, we have interviewed Jorge Martín, the secretary of the “Hands Off Venezuela” solidarity campaign. Ricardo Vaz: Let us rewind a little bit. This renewed attempt of overthrowing the government started with the Supreme Court decision of stepping in for the National Assembly, or at least that was the official pretext, and that even led some people who in the past had defended the Bolivarian Revolution to now launch accusations of authoritarianism. What is your analysis on this? Jorge Martin: I will stress two different points in relation to this. One is that, in deciding one’s position in relation to Venezuela, one cannot focus on the details of the constitution or who broke this or that rule, but on fundamental class issues. What class interests are represented by this opposition? And is the victory of this opposition a step towards democracy, an advance of the interests of the working class and the poor or not? It is clear that it is not. It will be a massive setback, and this is the starting point for any analysis. In relation to the Supreme Court, its decision was completely justified by the fact that the National Assembly is in contempt of court. The National Assembly had been warned over a one year period and has twice rejected the decision of the court to declare null and void election of three MPs from Amazonas state for electoral fraud. If the opposition wanted to, they could just accept that and trigger new elections in the Amazonian state. They would be favoured to win those elections and then have a legal National Assembly that would not be in contempt of court. RV: On the other hand, there have also been articles, for example, in Lucha de Clases or in Venezuelanalysis, which also argue that liberal/bourgeois democracy is not a sacred system to be preserved at all costs. It will become incompatible with the construction of socialism. JM: From a Marxist perspective, it is clear that you cannot take over the ready-made machinery of the state and use it to have an institutional framework that is at the service of the working people. But during the 15 or so years that Chávez was in power there were many opportunities for doing that; i.e., for moving towards the abolition of the bourgeois state from a democratic perspective. For instance, there were many occasions in which chavistas had a big majority in the National Assembly. There was even a time when the opposition boycotted the National Assembly elections (in 2005) and were not even present. Chávez could have passed an enabling law at that time, as he did on a number of occasions, saying that all the means of production were nationalised in a democratic plan and use that as a spur for the formation of workers committees, communal councils, and then convene a National Assembly of representatives from the communal councils and workers committees which would then take power. There could have been a more or less peaceful transfer of power from the old state to the new one. Chávez, before he died, in his last speech, said that there were two tasks left undone in the Bolivarian Revolution. The first one was moving towards a socialist economy, because Venezuela still had a capitalist economy. He was very clear about this. The other one was the replacement of the old bourgeois state apparatus of the 4th Republic, which was still in place, by a communal state, a state based on the communes. If you want, that is one way of putting it, that you need a revolutionary state based on revolutionary councils of people in the neighbourhoods and workers in the factories. And this is something that was not done, and now it is a big problem. In many respects the hallmarks of a capitalist state are still being reproduced, even in institutions and ministries created under the Bolivarian Revolution and fully staffed by people who consider themselves chavistas. The fact that this has not been solved in all these years when circumstances were much more favourable is now a weight over the shoulders of the Revolution. JM: That is true. There is a struggle, you could say, between the revolutionary rank and file, and the bureaucracy and the reformists within the Bolivarian movement. The bureaucracy and the reformists try to prevent and block the revolutionary initiative of the masses while the revolutionary initiative of the masses is the one and only factor that has saved the Revolution at every single turn. But the more this situation goes, the more difficult it is for people to continue mobilising at the rank and file level, particularly in the situation of severe economic crisis. I will give you one example. A few years there was a very strong and vibrant workers’ control movement, particularly in the basic industries in Guayana. 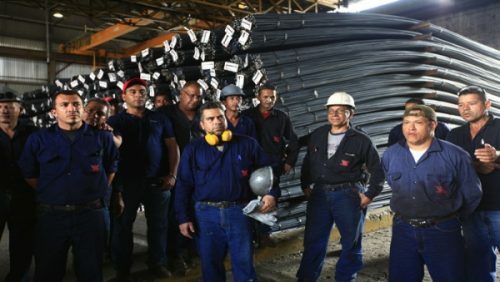 Chávez had a weekend meeting with worker representatives from all these huge steel and aluminium factories like SIDOR, ALCASA, VENALUM, and the workers’ demand was for workers’ control. 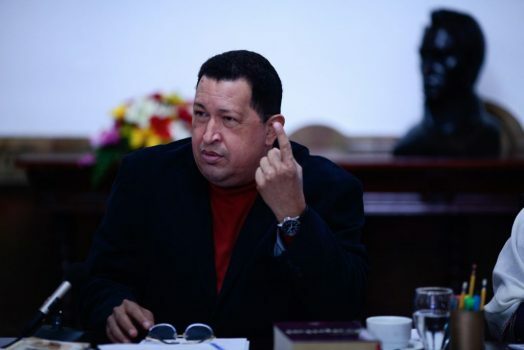 And Chávez agreed, he said “I stake my future with the working class”, (“me resteo con la clase obrera”), and he appointed as directors of all these companies workers that had been chosen by the workforce. This was not a perfect example of workers’ control, there were many problems, but there was an attempt to move in that direction. But now none of these workers’ directors are in place. They have all been replaced, in general by military officers. In many cases they are extremely corrupt and they have suppressed the revolutionary initiative of the workers in these factories. This creates demoralisation, scepticism, the withdrawal of people from the movement, and it weakens the Revolution itself. RV: Do you feel this is a generalised issue? JM: This is happening at all levels. For instance after the December 2015 opposition electoral victory there was a big movement from the rank and file and left-wing chavismo. People were very critical. They wanted more participation, they were were blaming the leadership for the defeat. Amongst other things, the candidates had not been chosen from below but appointed from above. 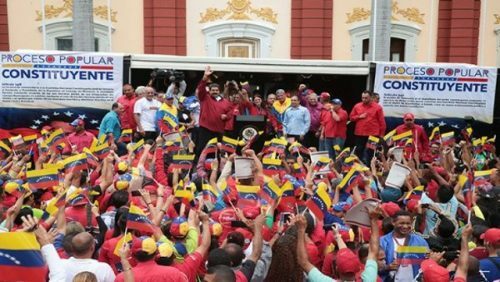 Maduro reacted by talking with these people that were demonstrating outside Miraflores palace, and he convened the Communal Parliament and later the Congreso de la Patria (“Fatherland Congress”). But these initiatives have ended up being empty talk-shops in which people go to the meetings, they are lectured by different government or PSUV officials, they are never allowed to have a say, and above all they are not allowed to make any decisions. So people have become very demoralised and sceptical about these bodies. This is one factor that is now bearing down on Maduro’s call for a Constituent Assembly, with people wondering whether they will see a repeat of these scenarios or have a real chance to elect their own representatives. RV: Let me put a question about the Constituent Assembly in a different way. Could it be that the chavista leadership realises that their backs are against the wall and that the only way forward is to radicalise? Even indirectly, if there is no possibility of dialogue with the opposition, could radicalisation be the only way forward? JM: I cannot tell you what the Bolivarian leadership is thinking. What Maduro said, when he announced this at May Day demonstration, was that after they had tried to enter into dialogue with the opposition, there had been no response, and therefore the government was taking this step in the sense of entering into a dialogue with the people in general, that this was the only way of getting everyone together in an elected body which could bring the conditions for peace. So there is an element of that, of appealing to popular mobilisation, in the spirit of the original Constituent Assembly of 1999 which was very widespread and generated a lot of debate. But at the same time, when you look at some of the issues that have been put on the list for discussion for the Constituent Assembly, there is no indication that the idea is to go for a radicalisation of the Revolution. For example, there is one point which is about the economy, which basically says that Venezuela needs to build a “post-oil” economy that works for all and with all the different property forms that exist today. That means the maintenance of a capitalist economy. The government has made an appeal to business owners to participate in the Constituent Assembly. They will have their own representatives elected to this Assembly. JM: Precisely. So on this regard I think it is a continuation, rather than a change from the previous policy of making appeals to the capitalist class to invest, to be reasonable, to cease in their attempts to overthrow the government. And these appeals come with concessions, which may involve lifting price controls, handing over hard currency reserves to private capitalists for imports at preferential rates, subsidies for production and investment, etc. This is a policy that has failed consistently for 17 years. On the other hand, it has to be said that amongst a section of the rank and file of the chavista organisations, the Constituent Assembly has been seen in the way that you suggest, as an opportunity for participating and radicalising the Revolution. All the reports that I have seen say that the meetings that have been organised in workplaces and neighbourhoods to discuss the Constituent Assembly have been well attended, that the people are interested, they want to participate, although there is also a certain scepticism on whether the bureaucracy will allow the people to elect directly their own representatives and have a real voice in this assembly. RV: Wrapping up, how do you see the situation developing in the coming months? JM: It is difficult to say. I would say the main problem in Venezuela, which is at the root of everything, is the fact the Bolivarian Revolution has lost a lot of support, and this we need to identify why this has happened. This was revealed in the National Assembly elections in December 2015. This was the first time, other than the constitutional referendum of 2007, that the Bolivarian Revolution lost an election contest. The reason for this is not so much a shift of people from supporting chavismo to supporting the opposition, but a lot of people abstaining. The Bolivarians lost about a million votes between the presidential and the National Assembly elections, while the opposition’s increase was much smaller. On the one hand this is explained by the economic crisis. But not just the economic crisis in itself, also the government’s handling of the economic crisis. Many people cannot see whether the government has got a strategy or not. One day they are railing against the economic war carried out by private businesses, the next day they are calling on private businesses to collaborate, giving them money, making concessions, subsidies and so on. There is also the impact of corruption, bureaucracy and reformism within the apparatus at the top of the Bolivarian Revolution which has created, as I said before, scepticism, pessimism and even cynicism among layers of people who previously supported the Revolution wholeheartedly. And this is the main problem. Most people know that they are going through a difficult situation, and they are quite prepared to accept that, so long as they do not see chavista leaders and officials living in luxury. This goes against the grain of the Bolivarian Revolution. The situation can only be turned around by measures that really eal with the economic problems of the country. And this means a radical shift in the government’s policies on this question, as well as a change in the way that politics is conducted. Right now there is a very bureaucratic, top-down way of doing everything. Even though there are big mobilisations, the people are not participating directly in their organisation, or in discussing the strategy of the movement. They are just allowed to respond, or not, to calls made from the top. So I think that, unless and until these fundamental questions are solved, the perspective is one where this government will fall. Either overthrown by direct force by the opposition, or defeated in the elections. Maduro has said that, rain or shine, presidential elections will take place next year. But they will take place in very bad conditions and it is very likely, all things standing as they are now, that chavismo will be defeated. RV: What would be the consequences of the opposition taking power? JM: That is something that really worries me, because the ascension of the opposition to power would be an unmitigated disaster. They would solve the economic crisis, but they would make the workers pay for it. They would massively cut public spending, destroy all the social missions, privatise social housing, apply the IMF recipes, etc. They would bring products back to the shelves, but at prices that no one would be able to afford. It would bring a massive backlash similar to what we have already seen to take place in Argentina and Brazil. But on a higher scale, because the depth and reach of the Bolivarian Revolution is nothing comparable to what happened in the past in Argentina or Brazil with the previous governments. 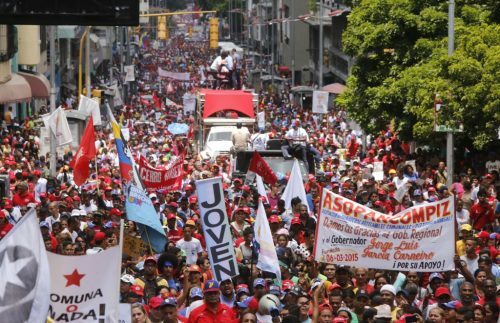 Moreover, this will be accompanied with a lynch-mob against anyone who looks like or is suspected of being chavista, a massive purge of the state apparatus and institutions, persecution and suppression of democratic rights of the chavista working class and poor majority. This is quite clear. And it is from this point of view that I am making the criticism of the government policies, because I think the policies of the government are not conducive to defending the Bolivarian Revolution but leading directly to disaster. • Jorge Martín is the secretary of “Hands Off Venezuela”, a campaign in solidarity with the Bolivarian Revolution and in opposition to imperialist intervention in Venezuela. He is also a member of the International Marxist Tendency and writes regularly on “In Defence of Marxism”. He can be followed on Facebook and Twitter. This article was posted on Tuesday, May 30th, 2017 at 11:15pm and is filed under Interview, Venezuela.